Though well received, the sixty-three poems that make up A E Housman’s A Shropshire Lad did not take the world by storm on publication in March 1896. Indeed, it was ten years before the volume’s modest sales began to surge ahead and turn it into one of the best-selling poetry collections of all time. Composers became aware of Housman’s evocative charm at a relatively early date – Sir Arthur Somervell’s 1904 cycle, A Shropshire Lad, being the first in the field of significant attempts to find music for it. Thereafter settings came thick and fast. Housman was not pleased. He took little interest in music as such, despite the intense ‘musicality’ of his verse, and on more than one occasion had reason to feel that his work had been betrayed by inept settings. But with Vaughan Williams and Ivor Gurney his ‘Shropshire lad’ was in good hands, and however much they may have strayed from the private world of his inner emotions, what they put in its place was just as valid. Alfred Edward Housman was born at Fockbury, near Bromsgrove in Worcestershire, on 26 March 1859, the eldest of Sarah and Edward Housman’s seven children. The most significant event of his childhood was the death of his mother on his twelfth birthday. The anguish he felt, made infinitely deeper by the cruel coincidence, led him to doubt the Christian Revelation. Though he did not abandon the idea of a God, he could only think of Him as indifferent to the sufferings of the world. The gradual realization of his own homosexuality only deepened his pessimism. In a situation without rhyme or reason, all that was left for the man of honour was to endure and do what must be done, even though the doing would be in vain. It was this stoic philosophy that was to give his poems much of their appeal. The facts of Housman’s life are simple enough. After taking a poor degree in Classics at St John’s College, Oxford (1882), he spent ten years (1882 to 1892) working as a civil servant in Her Majesty’s Patent Office. During this time a series of brilliant papers established him as an outstanding Classical scholar and in 1892 he was appointed Professor of Greek and Latin at University College, London. In 1911 he became Kennedy Professor of Latin at Cambridge University where, as a Fellow of Trinity College, he remained for the rest of his life. He died on 30 April 1936, famous both as a Classical scholar (particularly for his work on the poet Manilius) and as the author of A Shropshire Lad and Last Poems (1922). A third volume, More Poems, was garnered from his manuscripts and published posthumously in 1936. It has to be said, however, that few English composers have taken on board every aspect of the message they contain. To Vaughan Williams the spirit of stoic endurance would have made a powerful appeal; to Gurney, their celebration of the English countryside and longing for a ‘land of lost content’ would have been irresistible. Both would have warmed to the dramatic situations they enshrine, and to the grief Housman felt at the thought of young men dying bravely on the field of battle – for in reacting to the Boer War, in which his brother Herbert was killed, Housman powerfully anticipated the horror and futility of the First World War; A Shropshire Lad was a talisman to be found in many a knapsack. Neither composer, one fancies, would have been aware of any homosexual overtone; nor indeed was the vast majority of the reading public. But in adapting Housman to their own view of life, both composers were able to create works of integrity and conviction. Ralph Vaughan Williams composed On Wenlock Edge – a cycle of six songs for tenor, piano and string quartet – in 1909, and the first performance took place in London’s Aeolian Hall on 15 November that year. In the 1920s he made an arrangement for full orchestra which was first heard on 24 January 1924. Coming as it did at a critical point in the composer’s development (he had just spent three months in Paris hoping to acquire ‘a little French polish’ from Ravel), it is hardly surprising that several stylistic elements jostle for place in the music of this cycle. The influence of folk song is strong, but so is the residual influence of his Brahmsian upbringing, not to mention his newly-found interest in French atmospheric colour effects. Yet somehow all these elements are welded together in a work that is totally convincing. Without having any recourse to musical cross-references, Vaughan Williams gives the six songs a remarkable sense of unity – the music, essentially symphonic in its conception, sweeping forward in one great arc. Where appropriate, he treats the song as drama. Thus the conversation between the living and the dead in ‘Is my team ploughing?’ becomes a miniature opera, while the bell-like accompaniment of ‘Bredon Hill’ paints a picture of great dramatic intensity. A similar quality informs the accompaniment of the first song, ‘On Wenlock Edge’ – the strings flaring and quivering in powerful simulation of the gales that trouble Wenlock’s woods, and the emotional gales that have troubled the life of man since time began. Perhaps the moment most characteristic of Vaughan Williams’s attitude to life comes at the end of the cycle, when his evocation of the calm of death inspires a vision of the Celestial City – something that was to come again and again in his later works. Though somewhat at odds with the poet’s grief and bitterness, Vaughan Williams’s mood of acceptance and fulfilment raises the cycle to a level of exceptional spiritual awareness. Also a Gloucestershire man (Vaughan Williams was born in Down Ampney), Ivor Bertie Gurney seems to have begun setting Housman’s poetry in November 1907, after having been given a copy of A Shropshire Lad earlier that year by his godfather. By May 1908 he was soliciting the poet for permission to perform certain settings, and it may well be that the two songs in The Western Playland that are firmly dated 1908 (‘Loveliest of trees’ and ‘Is my team ploughing?’) formed part of his plan. But, characteristically, both songs were revised when, between 1920 and 1921, he came to assemble the complete cycle. The seven songs that make up Ludlow and Teme seem all to have been composed towards the end of 1919, with the scoring for string quartet and piano completed in 1920. Both cycles were published as part of the Carnegie Collection of British Music: Ludlow and Teme in 1923 and The Western Playland in 1926 – by which time Gurney was in the care of the City of London Mental Hospital where he was to remain until his death. Unlike Vaughan Williams, Gurney’s approach to Housman’s poetry was not dramatic or symphonic – the difference in the emotional intensity of their settings of ‘Is my team ploughing?’ is striking. 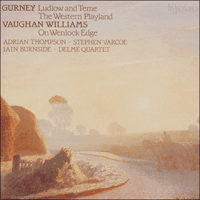 Gurney’s approach, in both cycles, is essentially lyrical and folkish (though, unlike Vaughan Williams, he was never a collector of folk song). But however simple his vocal lines may seem, they are in fact the outcome of constant and subtle variation in the service of a very exact interpretation of the words. Gurney the fine poet forced Gurney the fine composer into a respect for language second to none, and consequently into a very fluid musical style. In his handling of the string quartet and piano, however, he set performers many problems of balance and interpretation. The accompaniments are generalized mood-pictures: backgrounds to the all-important vocal lines, with only slight pictorial detail to provide an interpretative anchor. But the problem of doing justice to this subtle, ever-shifting harmonic background is worth solving, for these are surely among the most beautiful of all Housman settings. Scattered throughout are clues to Gurney’s own tormented personality and preoccupations: the plaintive ‘I wish one could know them’ (‘Ludlow Fair’) that echoes his search for friendship; the breathless ecstasy of ‘Far in a western brookland’ that tells of his constant longing to be in his own beloved Gloucestershire. Nor was it difficult for a man who had served as a private in the battlefields of the Somme and Marne to identify with the dead and dying soldiers of ‘On the idle hill of summer’. In Housman, Gurney found a mirror of his own nature and experience and responded accordingly.